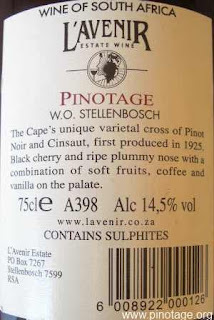 My Wine of the Month for June is L'Avenir Estate Pinotage 2005. Showing signs of full maturity, with plenty of sediment, this is a sleek elegant city slicker of a wine. I believe this was the last vintage that Francois Naudé was responsible for , shortly afterwards the estate was bought by Laroche and Francois handed over the winemakers baton to Tinus Els. By the time the 2005 vintage was bottled the labels had changed to the brown Laroche label, but this bears the old label at the request of The Wine Society in the UK who’d were stocking several other L’Avenir wines. I have never had the opportunity to taste a Pinotage before. I have to say I don’t recall ever hearing about it either. Wow, I have been missing out on a wonderful wine. At first pour, this is a beautiful deep ruby colored wine. It has wonderful aromas of blackberry, black cherry, plum and oak but don’t go thinking this is yet another Pinot. This wine is incredibly complex with delightful flavors hidden from your first taste but waiting for you to discover them with subsequent sips. Luscious vanilla, cedar, dark chocolate, and tobacco are just flavors waiting for you. The Pinotage that impressed? 2006 Fort Ross Vineyard, Sonoma Coast Marcia marks it 5/5 and says "I think I would invest in two cases – yes, it’s that good." Holy Mother of Macaroni, forgive me, for I have sinned. Numerous times, with numerous glasses. This is by far my favorite discovery this year. The aroma? Once you open this sucker and let it breathe(this time, because I was cleaning under the kitchen sinks and the upper cabinets, it was closer to two hours), oh my, what a glorious aroma. Right off the bat, you can smell the richness of the wine. I’m not kidding when I tell you I swear I smelled coffee or some mocha(various investigation on Snooth.com shows it is indeed espresso I was smelling. I’m NOT insane!). Of course, being a coffee-holic, I’m sold right there. But oh, no, my friends, the festivities were only beginning. The taste? Superb! Boysenberry, Chocolate, Espresso, Plum, and a multiple of others that many more bottles of imbibement(is that a word? wordsmiths, help!) will no doubt help me solve eventually. It’s an elegant finish. Meaning, with all of these flavors co-habitating, you would expect a lot of deep flavor. it is there, but it’s not overpowering. I have had pinotage that was too much going on all at once. This is, happily, not the case here. It’s so smooth, that it’s not odd that you suddenly discover several glasses have been consumed. That was not a confession. That was a revelation. The wine is full on the palate and powerful at 14.4% alcohol. In the glass it just oozes raspberry fruit, showing on both the nose and palate. It is surrounded by soft touches of vanilla and wood spice with a somewhat creamy mouth-feel. The wine has dusty, coco-powder like tannins that are firm but approachable. Bruce Jack, winemaker for Flagstone and Kumala has a way with words and a love of Pinotage and he's put the two together in a brilliant new article. Like its mother, Pinot Noir, brilliant examples of Pinotage are few and far between. But like Pinot Noir, those examples are life-changing if you are fortunate enough to encounter them. They are so enticing and beautifully satisfying, it’s like a light goes on in your mind; like a secret trap door opens and you step into another world – a fabulously ethereal world of heady aromas, seductive flavours and intense, luscious sensations. Your head spins and you fall in love. My personal experience is that wines like these aren’t readily crafted from varieties that are generally of better standard quality, like Cabernet Sauvignon, Tempranillo, Merlot or Shiraz. Rather, they seem to be made from the recalcitrant, edgy varieties like Pinot Noir, Pinotage, Monastrell and Nebbiolo. I have no idea why this should be. But something magical happens when these shy, tricky varieties unexpectedly shine. The effect is momentous. It is as though they rocket you up to heaven, blazing past those other consistent and trustworthy achievers. Each bottle reflects how the vines prospered, or the grapes suffered in the scorching summer heat. Each glass tells how the leaves were battered by the drying wind, and the canes grew heavenward. Each sip reveals how conscientiously and lovingly the wine was crafted, and how well it has survived the journey to your lips. In each aroma and flavor molecule is a memory of this collective energy and effort. Nature, human intervention and luck combine to tell a story of circumstance and cycles. “Pinotage is needed and it is something to have pride in! And Cinsaut (Pinotage is a cross of the cultivars Pinot Noir and Cinsaut) is not the workhorse or donkey of a grape it’s often described as. 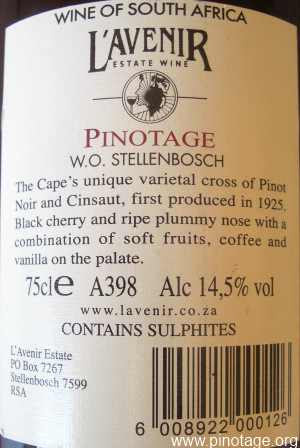 Back in the 1980s, it was fashionable to be rude about Pinotage but not any more. I want the Pinot Noir characters brought out in cooler areas and the Cinsaut character in the warmer areas. Beyers Truter does wonderful stuff.